Caption: McDonald’s book explores the economic background and its effects on the city of Chicago. John McDonald, a Roosevelt University professor, will give a presentation on Chicago’s economy throughout the years on Wednesday, September 16 . McDonald, has been working in the field for the past 40 years, will be sharing with attendees about his new book entitled “Chicago: An economic history”. The book is set to come out later in September and will be published by the Routledge Press. 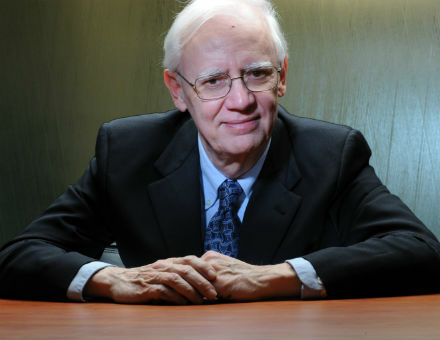 McDonald is referred to as “Chicago’s economist”, is very well known and respected in the field. Jon B. DeVries, director of the Marshall Bennett Institute of Real Estate at Roosevelt University offered insight on McDonald’s reputation in a statement posted on the school’s website. “No one has ever looked at the Chicago economy as thoroughly as John McDonald and we are delighted to have him share his latest insights on the city’s changing economic landscape,” he said regarding the upcoming event featuring the economist. The book itself, McDonald shares, took about ten months to write and having such a long background in the field helped immensely. It will share an in depth look at the economy of Chicago since 1820. The landscape of the city has changed an enormous amount since then, but according the McDonald, he has in his 40 years studying in the field seen changes in what types of jobs are the most popular in the city. “(There was) huge growth in service production, it essentially turned from good productions to service production,” he said. McDonald also added that the population of the metro area slowed over the years and that in turn had an effect on the city’s economy. He noted that the declining population has been a trend since around 2000. The book itself looks at the rise and fall of manufacturing in Chicago and how important the growth of certain industries are for the city’s future prosperity. While he is still preparing for the event being held at Roosevelt University’s Gerald Fogelson Forum on Real Estate, McDonald shared that he is currently working on a book similar to the topic of a course he taught at Roosevelt regarding the real estate and the financial crisis. “I’ve been working on a book that (studies what) created that fragile system,” he said. Those interested in the event being held on Wednesday, September 16, 2015 can sign up via the Roosevelt homepage. This event is free to Roosevelt students and faculty. It costs $25 for all others who wish to attend the event.